I’m still working through some West Coast scenes that I’ve been wanting to paint, and taking advantage of days in my studio before the next school semester starts. Last July, on a full-day drive between Anacortes, WA, and Kelowna, BC, we descended into the Methow Valley from a road that snakes through Washington State’s North Cascades Mountain Range. There was snow on the peaks as we drove through a series of spectacular mountain passes. I sketched Diablo Lake and the Washington Pass Overlook along the way. But as the road dropped down into the valley the temperature on the car thermometer went up, and up and up. By the time we reached the town of Twisp the temperature peaked at 107°F. I wanted to sketch the ochre shades of the rolling hills but it was just too hot. So today, on a rainy and grey January day in Montreal, when it’s far too drippy to paint in my car, that scene came back to me. On that scorching July day, the arid landscape of rolling hills continued as we drove north and crossed the border into the Okanagan Valley. After that drive, it came as no surprise that the next day forest fires began in the Okanagan. 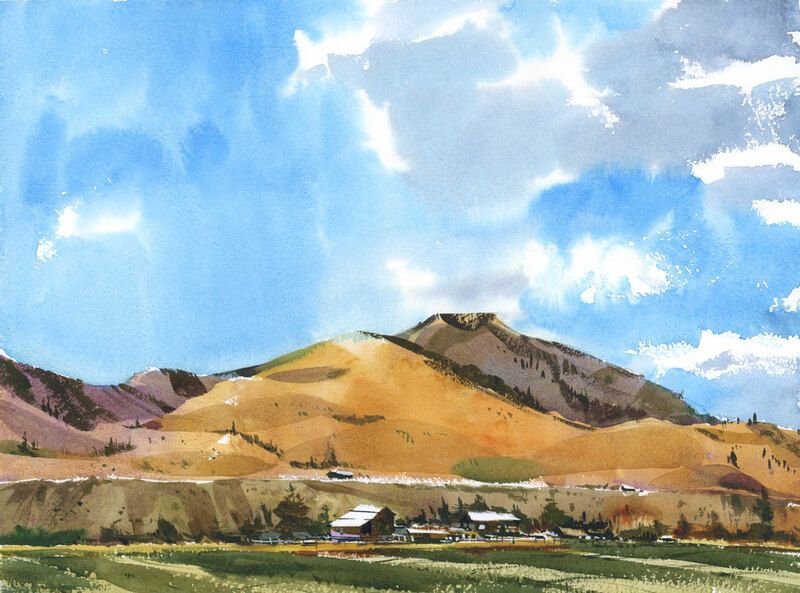 I hope to get back to the Methow Valley someday to paint, when the temperature is lower and the weather a bit more amenable to plein air painting. Shari, You are so talented. These are the colors and the edges of that region and a moment (day) ago you were accurately painting the grey reserve of Montreal in the winter.Wow! Holly, I don’t know if you’ve ever had this feeling but sometimes the vision of a place stays with you for a long time. That’s what happened with this. I had to get it out of my system by painting it. Thanks for writing. Ah, how nice to see those nice summer colors of the Eastern Cascades. I was just there last week, and saw a whole different, white, landscape. Thanks for sharing! Susanne, I wondered what the Eastern Cascades would look like in different seasons. How lucky for you to have visited such a beautiful place in the winter. Thanks for writing. Pam, I just looked up the location of the lodge. We must have passed right by it on our drive towards Twisp. Winthrop seemed really interesting too (in a Western sort of way) but it was crowded so we moved on to Twisp to have lunch. I will definitely keep this in mind. Sounds like the stuff I like to do to. Hike, paint, eat, drink. Perfect. so beautiful ! do you take photos too ?to help your memory ? Hi Vesna. I do take photos as well. They are never as great as I sights I see when I’m there but they are perfectly suitable for reference images for painting. Wow, thanks so much for writing. It means a lot to me to hear this. One of your gorgeous skies. I went back to see your other 2 paintings and didn’t remember them. But scrolling down, I commented on them. So much for my memory. Never been to this part of the country. It does seem beautiful. That’s ok Judy. I paint a lot, and you certainly don’t have to remember all of them. Yes, this sky was lots of fun to paint. Hi Shari. You mentioned about capturing the Ochre of the rolling hills,I see you have Raw Sienna in your palette, it looks like the Daniel Smith shade in the photo which I find quite red compared with say W&Ns but you have a really nice ochre on those rolling hills in the valley. What ochre are you using? At the moment we are enjoying the summer here in New Zealand and Im trying to capture those same ochres in the surounding hills around our home. Im loving your regular paintings and sketches and “put a wash on and leave it” approuch. Hi John, I can never decide if Yellow Ochre is worth keeping in my palette. I don’t use it that often but I certainly did for this. Raw Sienna would have been too transparent for this purpose. As for brands, both of these are Winsor & Newton. For earth colours like these, as well as Burnt Sienna, I am quite loyal to the brand. I have tried other manufacturers but the pigments are just not quite right if you are used to these. Enjoy your New Zealand summer! Great how you saved the whites on the roofs and the top of the cliffs. Marvelous sky! I love your paintings. They are so simple and wonderful. Your work encourages me to keep painting and to improve my skills. Thanks so much for letting me know Enrique. Much appreciated! Wow! I had no idea it was that hot when you traveled through there. You’ll have to go back in September sometime! I love this sketch. Those buildings against the warm hills. Beautiful!